There’s no question that the king of rip cuts in both shops and on the jobsites is the portable table saw. 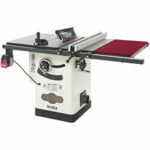 However, many people have a lot of questions about the best portable table saw. For starters, what size should the table have? And what about the blades’ size? And what can you actually do with a portable table saw? One of the things that you’ll be glad to know about portable table saws is that they come a long way. In the last couple of years, best portable table saws have improved their safety features, have a bigger cut capacity, and they can be easily setup. With such a wide variety and different specifications, it might be a bit confusing when you’re looking to buy the best portable table saw. So, we decided to give you a hand. The Makita 2705X1 Table Saw with Stand has been around for a very long time and, in our opinion, it is time to be updated. However, if in some of its features it didn’t behave as well as it was expected, like in terms of power, the truth is that this is one of the best portable table saws in what comes to smooth cuts. 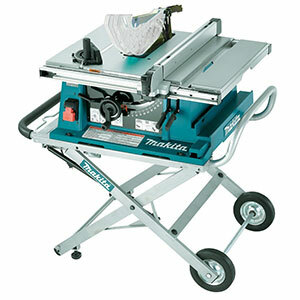 The Makita 2705X1 Table Saw with Stand features an external riving knife release makes it very easy to use. The design of the entire portable table saw is well though in terms of easiness and usability. The Makita 2705X1 Table Saw with Stand has the anti-kickback pawls and the blade guard connected on a one piece made of aluminum. However, if they were separated, it would be easier for you to connect to the riving knife. One of the best things about the Makita 2705X1 Table Saw with Stand is the fact that it is extremely easy to set it up. Even though the platform is very solid, you may need to adjust it a bit during the day in case it has a lot of movement. 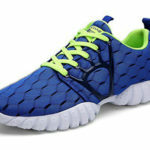 Make sure to check out the most comprehensive product reviews. The DEWALT DWE7499GD Jobsite Table Saw is, without any question, one of the best portable table saws on the market in 2017. While it may take you some time to learn where everything is since it is not very intuitive, as soon as you figure it out you won’t ever consider getting a different table saw. One of the things that keep being mentioned by the users is the dual riving knife system. 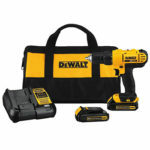 The truth is that by using this system, the DEWALT DWE7499GD Jobsite Table Saw is removing all the frustration of blade guard and anti-kickback pawls placements. All you need to do is to swap out the riving knife for the one that has the pre-installed safety attachments and it’s done. One of the best things about the DEWALT DWE7499GD Jobsite Table Saw is its fence system since it allows you the possibility to have the accuracy that you love. Since the stand isn’t gravity-rise, you will need to use a foot to make sure that you stabilize the DEWALT DWE7499GD Jobsite Table Saw. 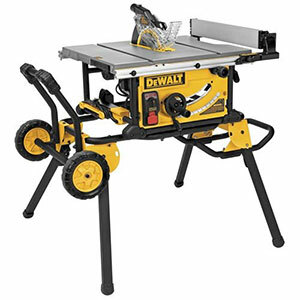 One of the main differences between the DEWALT DWE7499GD Jobsite Table Saw and the other portable table saws on this list is the fact that it features an open housing design which allows the motor cooling. However, this also means that you won’t have the storage for an extra blade. When you’re looking for a table saw, make sure that you also discover the best hybrid table saw. One of the main reasons why we decided to include the SKILSAW SPT70WT-01 Portable Worm Drive Table Saw on this list was because it is the only worm drive table saw. One of the things that we really like about it is its power. You can even compare it with the previous model we showed. Most users tend to like this portable table saw because it is extremely light and compact. However, it also shares one major concern – the fact that it has an open housing just like the previous portable table saw you mentioned, this means that storage is restricted. Even though the SKILSAW SPT70WT-01 Portable Worm Drive Table Saw is light, it really isn’t that great in terms of portability. However, in case you’re looking for stability, the SKILSAW SPT70WT-01 Portable Worm Drive Table Saw is the best portable table saw for you. Plus, if you usually use a truck to go to the jobsite, it’s just perfect to put it on and take it out o the truck bed. 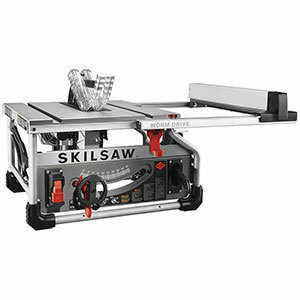 Another aspect that keeps being mentioned about the SKILSAW SPT70WT-01 Portable Worm Drive Table Saw is the fact that the cutting depth is remarkable. While the Bosch 4100-09 Worksite Table Saw is not a new model that just arrived at the market, the truth is that it is, without any question, one of the best portable table saws. Featuring a great stand and a solid fence, the Bosch 4100-09 Worksite Table Saw uses a metal overlay on the miter gauge, while most other table saws tend to use plastic. This same metal is also used to make the connection to the riving knife more durable. While the performance is more consistent than amazing, the truth is that the Bosch 4100-09 Worksite Table Saw is incredibly light, especially considering that we are talking about Bosch’s tools. The Bosch 4100-09 Worksite Table Saw only weights 60 pounds. Featuring an innovative gravity-rise stand, the Bosch 4100-09 Worksite Table Saw includes a 1-year warranty. Featuring a 15-amp motor, the Hitachi C10RJ 10″ 15-Amp Jobsite Table Saw is able to rip through hardwoods easily and quickly. One of the things that we most like on the Hitachi C10RJ 10″ 15-Amp Jobsite Table Saw is the fact that you can easily adjust the rip fence. It’s not only fast as it is also smooth and accurate. Plus, it features an electric brake and a soft start to make sure that you’re not only productive as well as to increase your safety. One of the things that keep being mentioned by the Hitachi C10RJ 10″ 15-Amp Jobsite Table Saw users is the onboard storage that it contains. You can easily keep all the parts and tools you need easily accessible and organized. 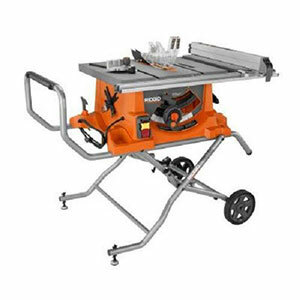 Whenever you need to cut larger material, you will be happy to know that the Hitachi C10RJ 10″ 15-Amp Jobsite Table Saw includes a rear outfeed support. 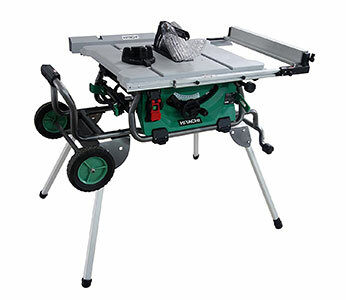 The Hitachi C10RJ 10″ 15-Amp Jobsite Table Saw includes a 2-year warranty. 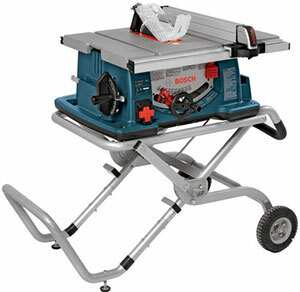 Bosch is one of the best manufacturers that you can find when you are looking for the best portable table saw. So, we just had to have a different table saw on this list – the Bosch GTS1041A-09 REAXX Flesh-Detecting Jobsite Table Saw. The Bosch GTS1041A-09 REAXX Flesh-Detecting Jobsite Table Saw uses the same built foundation as the other Bosch table saw we already showed you above. However, in our opinion, this might be even a better table saw that deserves to be checked out. Even though the Bosch GTS1041A-09 REAXX Flesh-Detecting Jobsite Table Saw performance is similar, there are some improvements such as the better but. Plus, in what concerns with the dust collection, the Bosch GTS1041A-09 REAXX Flesh-Detecting Jobsite Table Saw is also superior because it includes a narrow throat plate opening. The Bosch GTS1041A-09 REAXX Flesh-Detecting Jobsite Table Saw also includes a two-shot activation system and one of the things one like most, the ability to keep the blade from damage. In fact, the Bosch GTS1041A-09 REAXX Flesh-Detecting Jobsite Table Saw features the active response technology that avoids the user injury in case you have contact with the blade. This technology will immediately make that the blade is dropped under the table and the system will be completely reset in just 60 seconds. 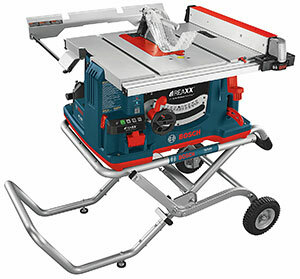 The Bosch GTS1041A-09 REAXX Flesh-Detecting Jobsite Table Saw is amazing in what concerns with portability. 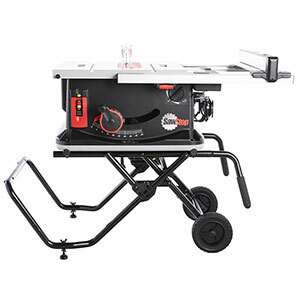 It includes a gravity-rise wheeled stand which allows you to take this table saw anywhere you want within the jobsite as well as the setup and take down processes couldn’t be easier. Either if you are a contractor or just a DIY passionate, the Delta Power Tools 36-6020 Portable Table Saw with Stand is one of the best portable table saws that you have on the market in 2017. One of the things that you can immediately associate with the Delta products is their quality. While the Delta Power Tools 36-6020 Portable Table Saw with Stand seems to please most users, the truth is that almost all of them tend to mention the ability of the fence to slide out which allows them to have more accurate cuts besides it is a lot easier to make any adjustments you need. One of some of the best portable table saws seem to lack is their storage ability. For one reason or the other, you may end up without some space that you need to even carry an extra blade. 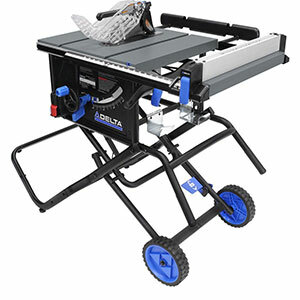 However, this won’t happen with the Delta Power Tools 36-6020 Portable Table Saw with Stand since the onboard storage is just a standard in this model. This assures that you will always have all the accessories you need while on the move. Featuring a rip capacity of 30 inches, the Delta Power Tools 36-6020 Portable Table Saw with Stand is great when you need to handle larger rip cut projects. The Ridgid ZRR4513 15 Amp Portable Table Saw with Mobile Stand is a factory reconditioned product which means that after it was returned, the company did some changes in order to make it work better. While we can’t say this is the best portable table saw on the market, the truth is that even under this conditions, it works better than most portable table saws. Featuring a Retract-A-Rip system, this extendable table allows you to have more 25 inches available when you are working. This means that you’ll have more space not only for your cuts as well as to place some material you might need near you. One of the best things about the Ridgid ZRR4513 15 Amp Portable Table Saw with Mobile Stand is the fact that it comes with a 15-Amp heavy duty motor that is able to help you with the most difficult cuts. Plus, since you can easily adjust the micro bevel, you’ll be more accurate than ever. One of the things most users like about the Ridgid ZRR4513 15 Amp Portable Table Saw with Mobile Stand is the fact that it includes an Ind-I-Cut alignment disk’s writeable surface. This allows you to align the cut line with the blade kerf without any problems and it is extremely accurate. The SawStop JSS-MCA Jobsite Saw with Mobile Cart is one of the best portable table saws on the market in 2017. Everything on this product was though up to the last detail. Just to give you a simple example, just table the assembly process. It will roughly take you 10 minutes since the only thing you need to do is to attach the handles and wheels, and the box aids. Featuring an amazing stand, you can count with a movable table extension that can be particularly helpful. You will also get 2 riving knives, one without safety guards and the other one with them. One of the things that we really like about the SawStop JSS-MCA Jobsite Saw with Mobile Cart is the fact that it is extremely easy to adjust the blade height. All you need to do is to turn the wheel. The most commented feature on the SawStop JSS-MCA Jobsite Saw with Mobile Cart is the fence. While on the front side you can find some clamping, it is great in what comes with stability and its ability to self-align. While you may not like the feel when you’re using this table saw, the reality is that it doesn’t vibrate a lot and is very smooth. 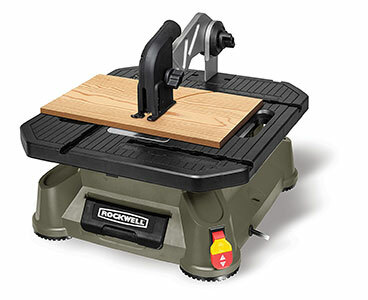 Last but not least, there is also the Rockwell BladeRunner X2 Portable Tabletop Saw. When you need to cut plastic, aluminum, tile, metal, or wood, and you need to make sure that you can have inside cuts, miter, scroll, and rip, the Rockwell BladeRunner X2 Portable Tabletop Saw is one great option. Featuring a built-in tabletop handle, you can easily take the Rockwell BladeRunner X2 Portable Tabletop Saw with you anywhere you want. After all, it only weighs 15 pounds. One of the best things most people like about the Rockwell BladeRunner X2 Portable Tabletop Saw s the fact that it’s extremely simple and easy to change the blade and they have a great compatibility with other blades on the market. Featuring a 5-piece starter blade set, a miter gauge, a steel rip fence, and a vacuum port, you will love the Rockwell BladeRunner X2 Portable Tabletop Saw.